HISTORY: The development of energy resources on the reservation over the past 60 years has replaced the overt injustices reined upon the Navajo in the 1800s. Dirty coal power plants and hazardous uranium mining adversely affect the daily lives of Navajos living on the reservation. Navajo weavers who split their time between the loom and the land, live close to the earth, bearing witness to drying riverbeds, the escalating pace of desertification, and to skies that are increasingly filled with harmful pollutants. 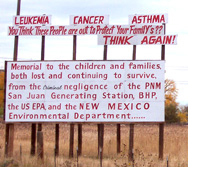 Deca des of uranium mining on Native Land is directly responsible for thousands of cancer deaths among Navajo miners, and has contaminated the land, air, and water for hundreds of square miles. Though the uranium industry and our government were made aware of the dangers of exposure to the radioactive uranium and radon gas in 1946, miners were not informed of the hazards until the mid 1970s, long after men began dying. Wives and children of miners were needlessly exposed to the harmful dust and residue brought home daily on clothing and shoes. Left without any way of providing for their children, many widows survived by raising sheep, both as food and for weaving. In the 1970s, as the government’s demand for uranium began to shrink, mining companies packed up and abruptly left the Reservation, leaving tens of thousands of Navajos jobless and over 1,100 uranium mines open and un-reclaimed. These mines continue to spew radon gas from their bowels and dust from the piles of uranium tailings. As doctors and researchers became increasingly aware of illness among miners, creating a question of liability and blame, the largest companies either changed their names or went out of business. Many Americans would not be surprised to learn that Kerr McGee (Silkwood) was one of the largest mine owners, along with U.S. Vanadium Corporation, which changed its name to Union Carbide. Despite a policy of indifference to past injustices, the current administration’s thirst for nuclear power and weapons has re-invigorated interest in uranium mining. As a result, two new uranium mining projects have been slated for the Navajo communities of Crownpoint and Church Rock, New Mexico. The Navajo feel they have paid dearly enough, having lived with the 50-60 year legacy of exposure to uranium waste and strongly oppose any new mining initiatives. Crownpoint, New Mexico is home to the Crownpoint Rug Auction, the only Navajo-operated monthly market that provides weavers direct access to consumers, without a trader or middle-man. Crownpoint weavers share the concern of many in their community that life on the land their ancestors once occupied, might come to an end if the uranium mining project goes through. Hydrologists and geologists agree that toxins from in-situ leach (ISL) uranium mining, the extraction process that will be employed at these two sites, will infiltrate the water supply within 7 years. Contamination of the regional aquifer will leave 15,000 Navajos with no clean source of drinking water. On the opposite end of the reservation, Peabody Coal Company has been extracting huge amounts of coal from beneath sacred ground at Black Mesa, in northern Arizona. While more than 1/3 of all Navajo households lack access to electricity, extracted coal is used to power homes as far away as Los Angeles, and to illuminate neon lights in Las Vegas. Each day this project also drains 3.3 million gallons of pristine water from the Navajo Aquifer. The water is used to carry the coal slurry through a pipeline over hundreds of miles to the processing facility. Removing billions of gallons of water a year, over a 30-year time period disrupts the regional hydrogen cycle, further weakening an already fragile and arid ecosystem. Once the coal is harvested from the slurry, Navajo water then travels even greater distances, as it is piped to provide year-round irrigation for golf courses and lawns in Phoenix and Tucson. While the desert southwest is subsidized with Navajo water, rainfall on the reservation shrinks annually. 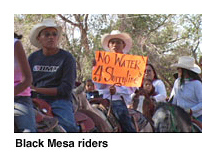 Black Mesa isn’t the only area of the reservation affected by coal mining. The valley that stretches from Shiprock to Gallup traps deadly toxins emitted daily from six of nation’s dirtiest coal power plants. While the six coal plants located in the Four Corners region contribute just 7% of the country’s annual coal power production, the combined yearly CO2 emissions from these plants amounts to more than half the total CO2 emitted in the entire United States. Outrageously high incidences of cancer, respiratory disease, and birth defects now add to the health and social challenges that plague the Navajo. House/Day Daughters - Tanisha, Alisha, and Felisha House are three industrious young sisters who sell hand squeezed lemonade to a long line of customers in the parking lot outside of the Crownpoint Rug Auction. The girls, ranging in age from 11 to 17, sell lemonade today, but dream about bringing their own rugs inside the Auction to sell one day soon. Their mother Bernice, Grandmother Dorothy, Uncles Ray Tolth and Robert Day, Aunt Marilyn Preston, and other family members are taking great care to pass on every facet of the weaving tradition to the girls. The family hopes that learning the weaving trade will ensure that the girls will be able to support themselves in an economy with high unemployment and few opportunities. The Crownpoint Rug Auction is a vital link between weavers and rug buyers. Ironically, this family purchased many of the churro sheep they raise from TahNibaa Naataanii, a successful weaver from Table Mesa who we began filming one year ago. A special relationship between the girls and TahNibaa has been born out of the extended family’s deep desire to teach the young weavers the traditional stories and ceremonies that tie them to their sheep, the land, and their ancestors. For Tanisha, Alisha, Felisha, and cousin Nicole to realize their dream of becoming weavers, Crownpoint must be kept safe from the dangers of deadly uranium mining. For now, we will focus on filming the girls as they put up their looms and begin their very first weaving projects. They will also accompany TahNibaa and Sarah as they herd the sheep on foot back to the winter corral some 10 miles away. For TahNibaa and Sarah Natani, mother-daughter weavers from Table Mesa, New Mexico, the loss of plant life means that good grazing land for their sheep is dwindling fast. Holding on to Navajo cultural traditions in a complex world is challenge enough. Sarah believes that soot that rains down from two coal power plants within 8 miles of her home is responsible for the loss of plants her sheep once relied on. The land around their winter home no longer provides sustenance for the herd, adding a financial strain on the family as they must now buy alfalfa to supplement the herd’s diet. TahNibaa and Sarah have invited us to join them on the seasonal pilgrimage up into the Chuska Mountains. The women will herd their sheep to the summer grazing lands,TahNibaa, on-foot, as 70-year-old Sarah makes the journey on an all terrain vehicle. The 20 mile round trip will take several days, providing a firsthand look at the condition of vegetation in the valley, and also at the relationship they have with the churro sheep that are so vital to their livelihood. Larry King grew up under the cloud of the aftermath of uranium mining. He provides personal testimony about his experiences working in the mines around his home in Church Rock, New Mexico. Piles of uranium tailings were left behind by United Nuclear Corporation, which contaminated the well that the mining company drilled for local people to use. Larry worked in the mines as an underground surveyor for many years. He was just getting off the late shift one morning when he witnessed firsthand, the largest nuclear accident in American history  the 1979 spillage of 100 million gallons of radioactive materials and 11 hundred tons of uranium tailings, from UNC’s holding dam into the Puerco River. 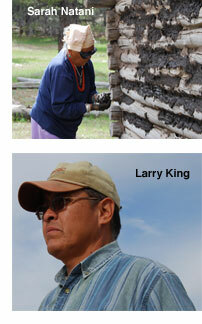 Larry’s father raised cattle that drank from the Puerco River. After the spill the mining company told the Navajo families in the area that the water in the river was safe for livestock to drink. It wasn’t long before the King’s cattle and sheep owned by neighbors along the river started dying in very large numbers. Anita’s father worked for more than a decade in the uranium mines near their home. The family maintained a ranch raising horses, cattle, and sheep in Sweetwater, Arizona. Mr. Harvey’s story is identical to that of thousands of other uranium miners. He was given no warning from the uranium company or the US government about the deadly consequences of exposure to radioactive uranium. As a result of overexposure, he suffered a massive stroke that left him paralyzed and unable to speak. It was into his wife, Jessica Harvey’s hands that clothing worn in the mines was laid for washing. Jessica, a well-known weaver in her own right, succumbed to the effects of uranium exposure too and now suffers from Parkinson's disease traceable to her husband’s work in the mines. Their illnesses have become so severe that they had to leave Sweetwater and move to Cortez, Colorado, next door to Anita who provides daily care for them. From her studio in Cortez, we will film Anita’s beautiful rugs and will record the stories they tell about Navajo culture. The rugs will provide a fascinating backdrop for the broader story of how the legacy of uranium mining continues to have a profound affect on so many lives. We will also return with Anita to the family’s ancestral Hogan in Sweetwater. While her parents are too weak to travel, we will film Anita as she recalls the life her family once enjoyed there. We will also visit the Navajo women and the sheep that supply Anita with fine churro wool for her weavings. Sara White learned to weave when she was 8 years old. She never dreamed she would be forced to give up weaving, something that she feels defines her as a Navajo woman. Sara is one of thousands of Navajos who have contracted respiratory disease or cancer, as a result of exposure to toxins released by the coal power plants located in or on the edge of the reservation. Sara suffers from a serious case of asthma. The wool she uses in her weaving now aggravates her condition, sending her into the hospital in an acute attack. Rather than give in, Sara decided to fight back. She has joined DinéCARE (Navajo Citizens Against Ruining our Environment). We will return to Sara’s home in Shiprock, New Mexico, and will accompany the DinéCARE activist as she drives deep into the reservation to educate her fellow Navajo about the health and environmental risks associated with the power plants and mining efforts. We will also witness her efforts to encourage individual families, as well as chapter houses, to rebuff mining company representatives who promise cash bonuses for signing over their grazing rights for mining activities. Finally, we will follow Sara’s efforts to help mount a campaign to fight the construction of two new coal plants proposed for the southern end of the reservation. THE FILM'S APPROACH: The approach of Woven Ways has been to enter the world of the Navajo and, with minimal narration, give voice to their deeply personal stories. The cadence of Woven Ways will be set by the rhythmic beating of the loom, and a soundtrack laden with melodic Navajo chanting. Storytelling takes place on their land, with their sheep, in their home, and at their looms. Close, intimate camera angles have been juxtaposed with the vastly beautiful and stark desert landscape of Navajo Land in eastern New Mexico and western Arizona. THE NEED: An opportunity exists to help the Navajo fight the exploitation of resources on their land that has cost them their health and threatens their way of life. We believe that Navajo victories over coal plants and uranium mining are well within reach. Few documentaries have been made in the last twenty years that address the endemic environmental racism facing those living on Native American tribal lands. Bringing this gentle story forth and allowing Navajo weavers to inspire support for Native American rights can help force the U.S. government and utility companies to make the shift towards cleaner and more sustainable energy choices.